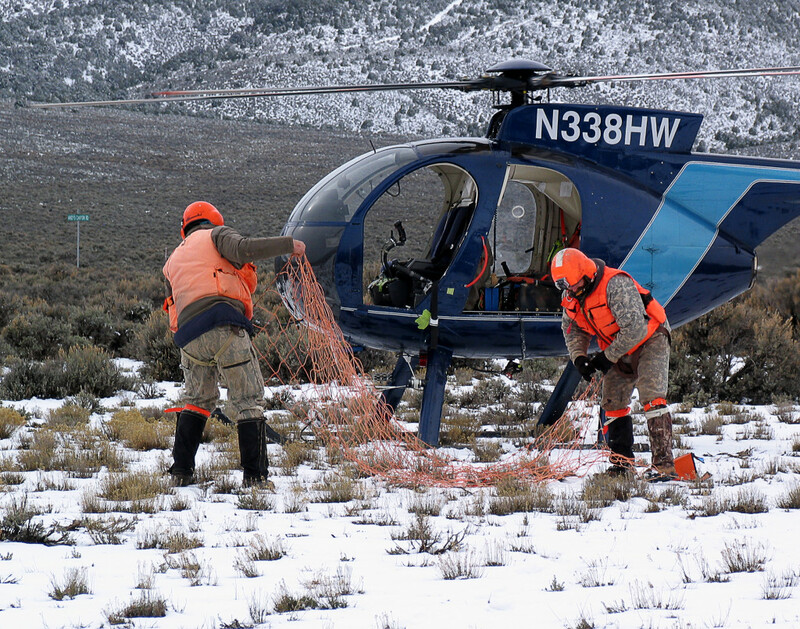 FEATURE – Despite the sharp bite to the flurried afternoon March 1, a collaborative group of helicopter pilots, biologists and student volunteers spent the day catching, studying and releasing Monroe Mountain coyotes and pregnant mule deer hoping to answer the question: Why is the mule deer population declining; and what roles do predators, and fawn survival, play in the equation? 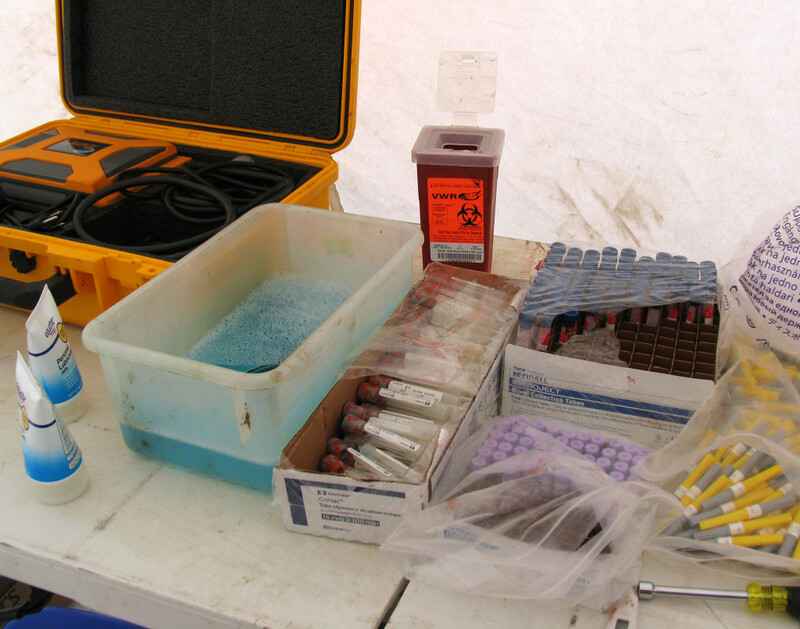 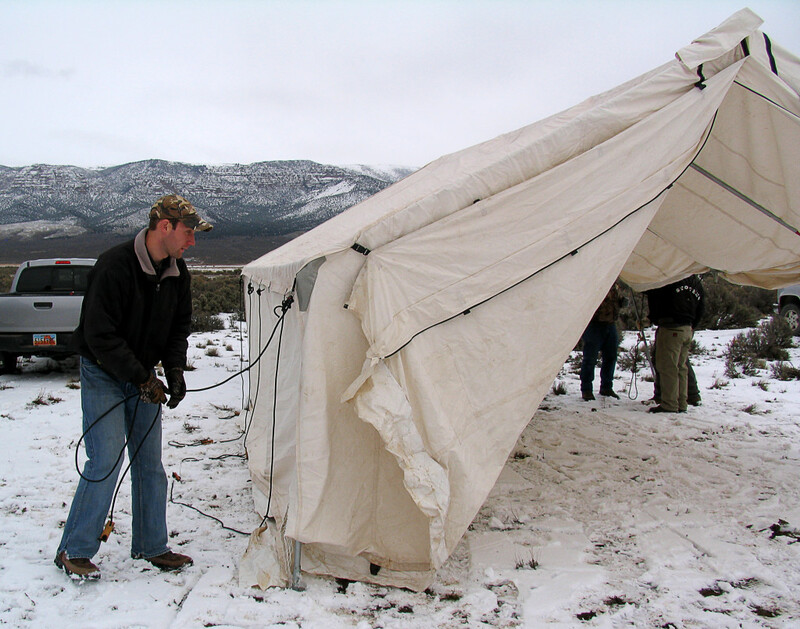 Arriving later than they expected to the staging area at Angle, the team of men from Utah’s Division of Wildlife Resources, BYU and Utah State University jumped into gear, erecting a makeshift triage tent with two tables full of equipment along the back and two exam tables to either side. 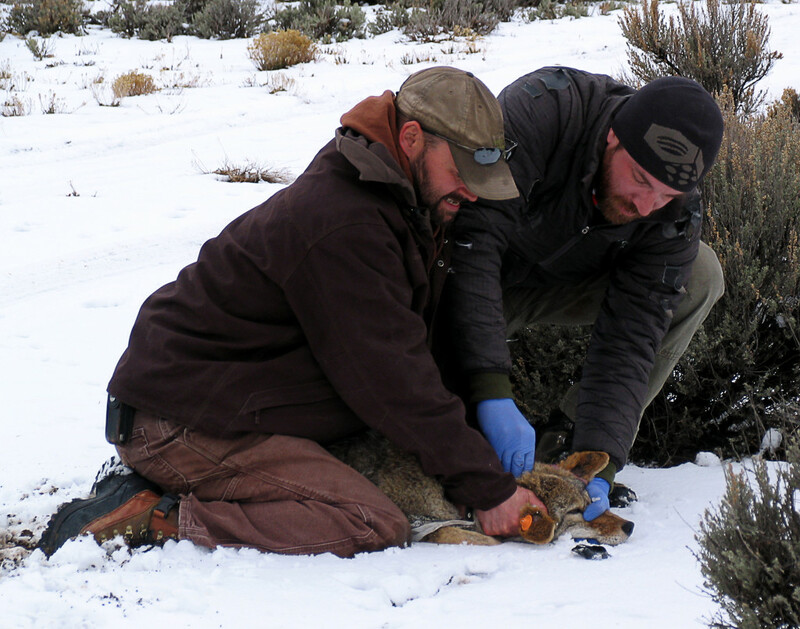 The team was ready just in time for their first air delivery from Helicopter Wildlife Services – a coyote that arrived with legs bound and jaw taped shut. 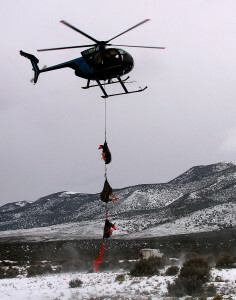 The wide-eyed animal was handed off to scientists who scrambled to find something to cover his eyes as the helicopter disappeared into the hills in search of more animals for the study. 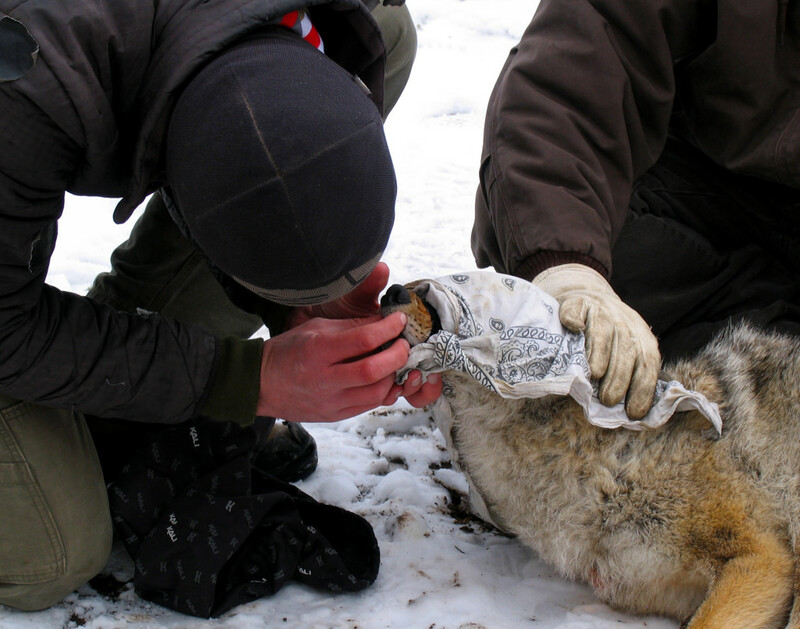 USU graduate student Peter Mahoney arrived just then, pulling a handkerchief from his pocket to quickly wrap the coyote’s face as he placed a calming hand on the animal’s back. Covering the eyes helps to calm the animal down, Mahoney said, and the legs are bound in a technique called hobbling which ensures the safety of both the animal and the researcher. 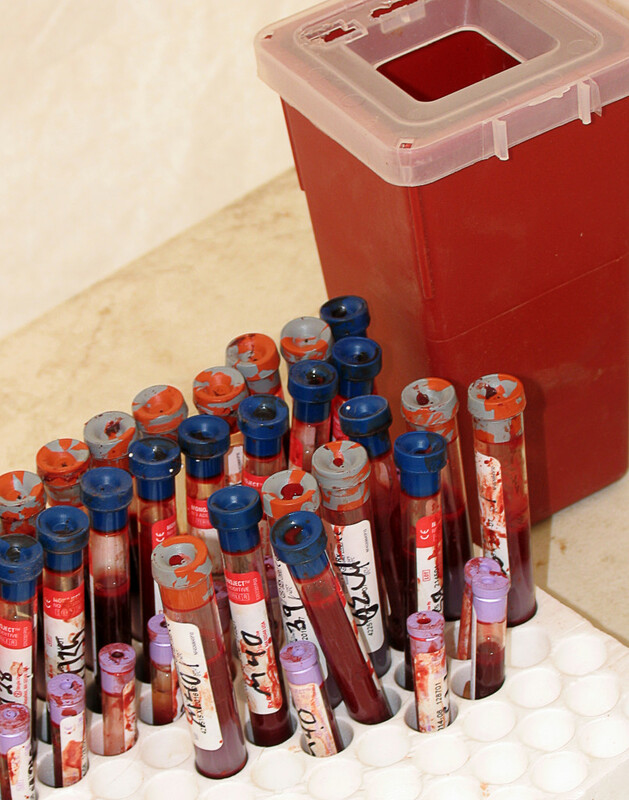 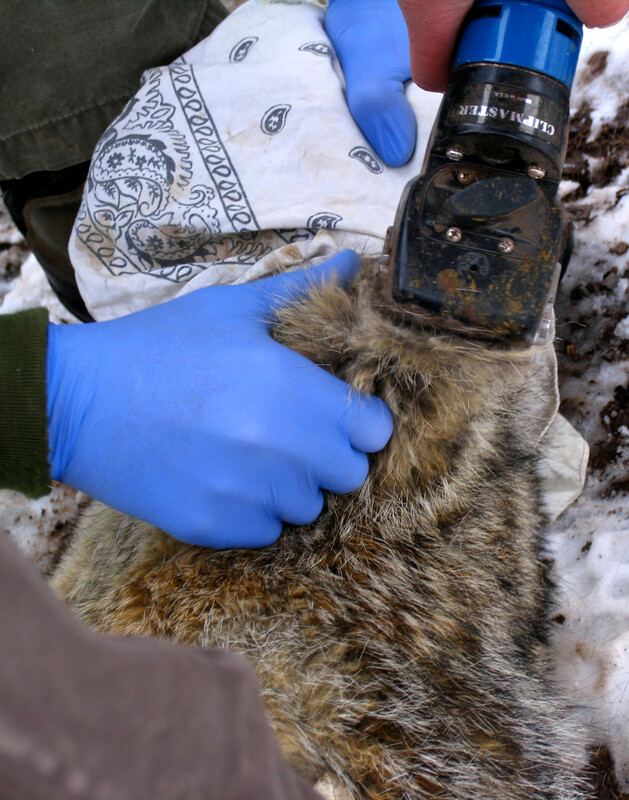 The team immediately began to conduct a number of exams on the male coyote to determine his age, weight, body length, shoulder height, wear on his teeth, and general health. 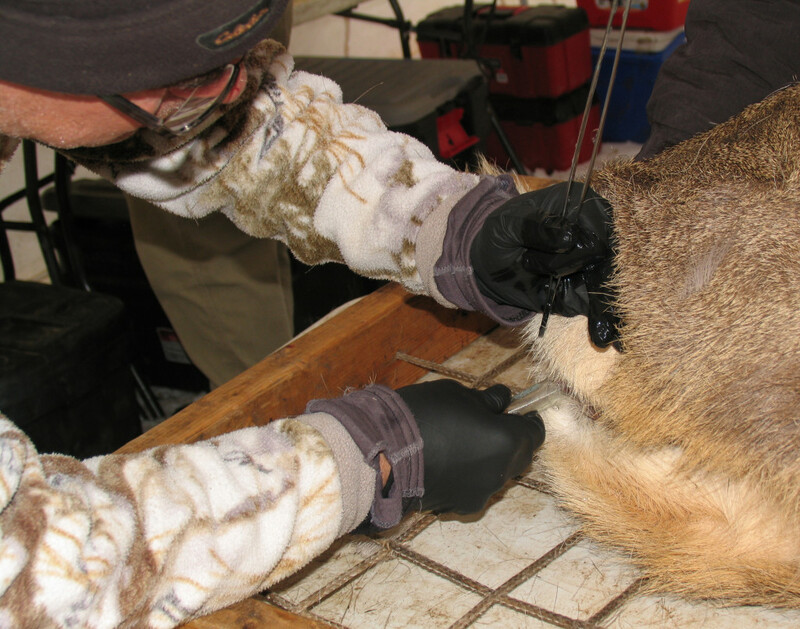 Though Mahoney noted the bare patches of hair on the animal’s ears citing a skin parasite called mange, he said the coyote was the largest capture he has recorded since the study began. 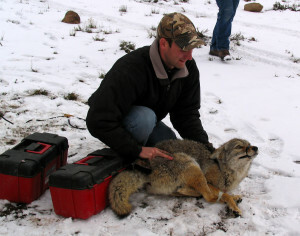 The coyote was so large that fitting him with a collar proved to be a greater challenge than expected for the seasoned professionals. 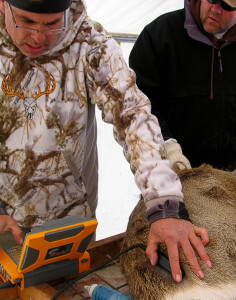 Though the collar size was adjustable, the largest setting was a bit tighter than Mahoney said he wanted. 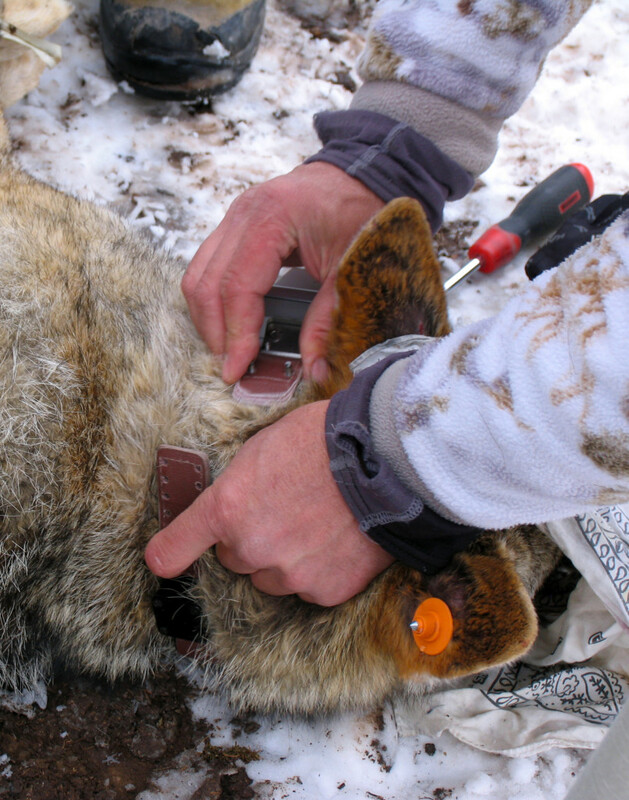 Removing the collar and shaving a patch from the back of the coyote’s neck, the researcher refitted the tracking device until he could easily slip two fingers between the two surfaces. 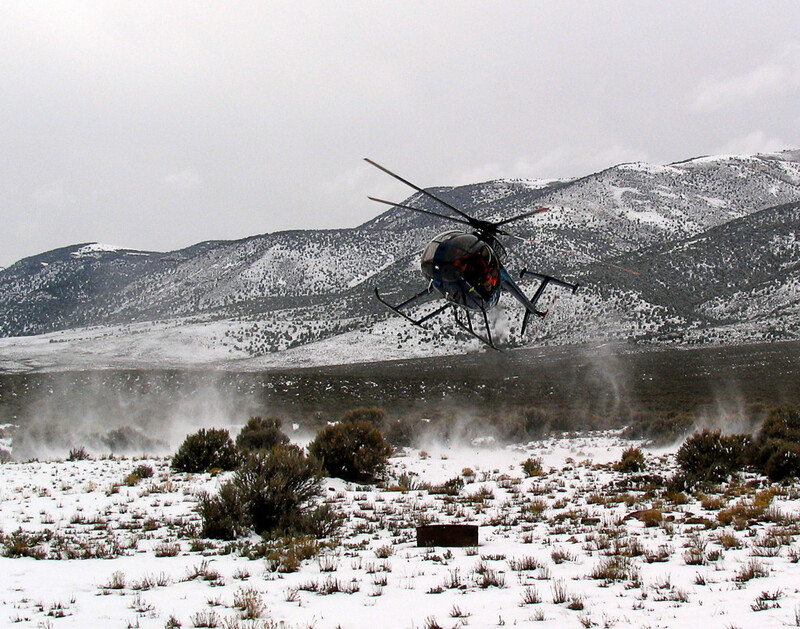 Just as the coyote was released back in the direction of where he was caught, the helicopter swooped in with a blast of dry snowy ice, dangling three pregnant does from from its base. 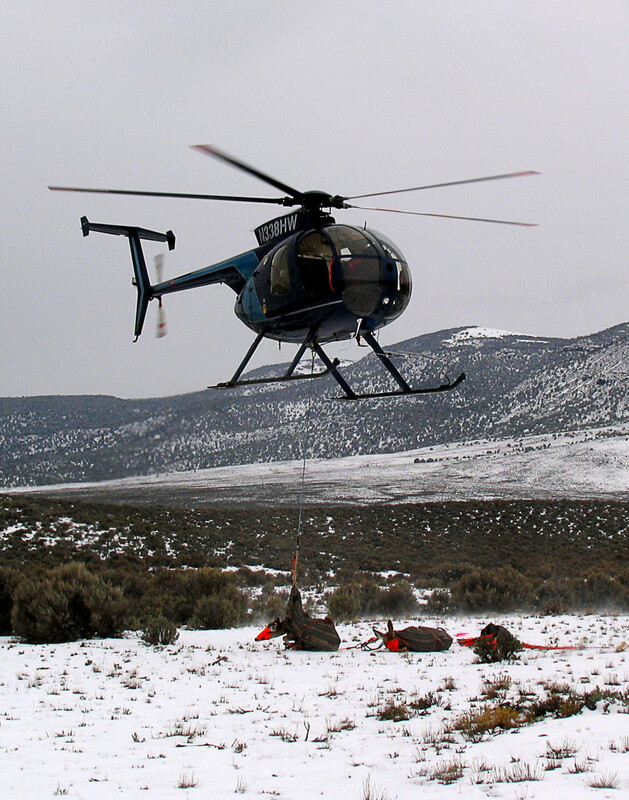 With surprising delicacy the pilot slowly lowered each sling-wrapped doe one at a time until they were all safely on the ground. 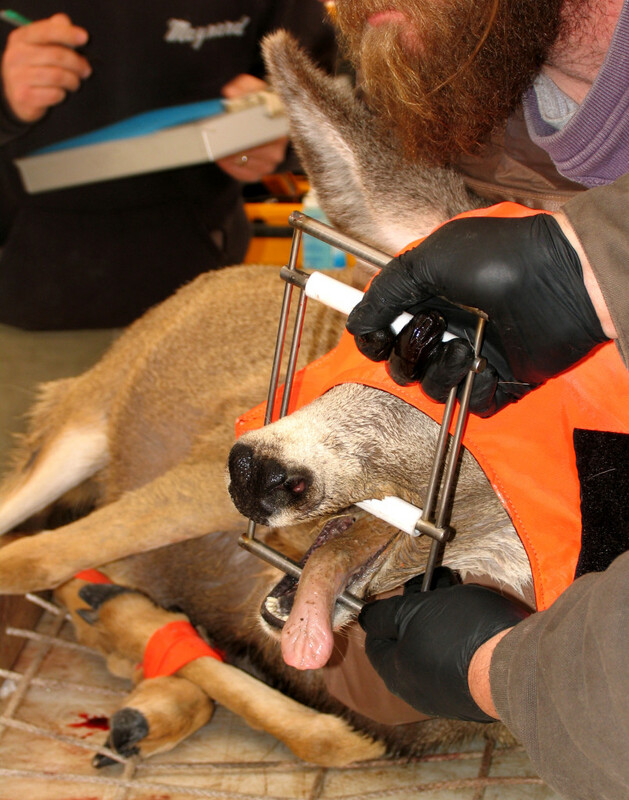 Hastily transferring the blindfolded deer to gurneys, researchers carried them to a weigh station before placing the does on the exam tables in the triage tent. 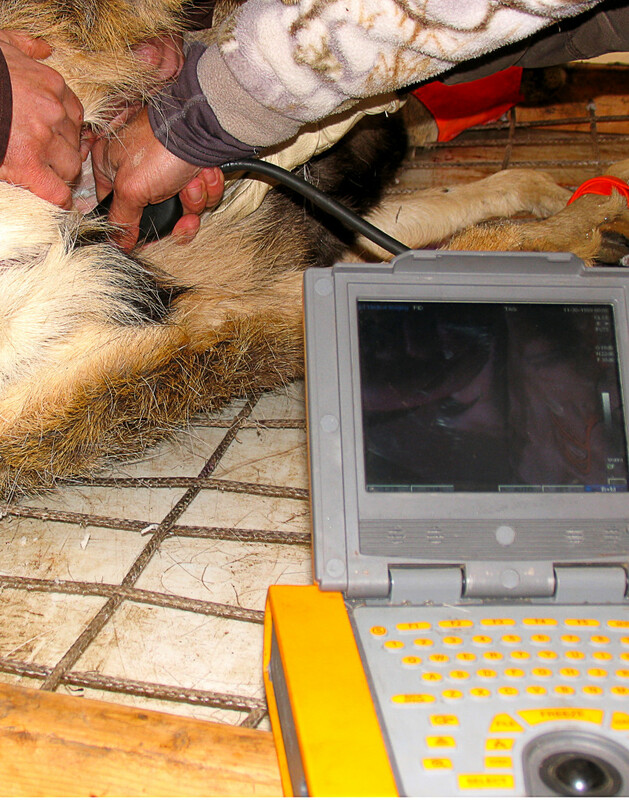 Reminiscent of alien abduction stories, each doe was thoroughly poked and prodded while researchers wrapped tracking collars on them, tagged their ears, drew blood, checked teeth and ran ultrasounds to determine both the health of fetuses and the fat reserves left on the mothers. 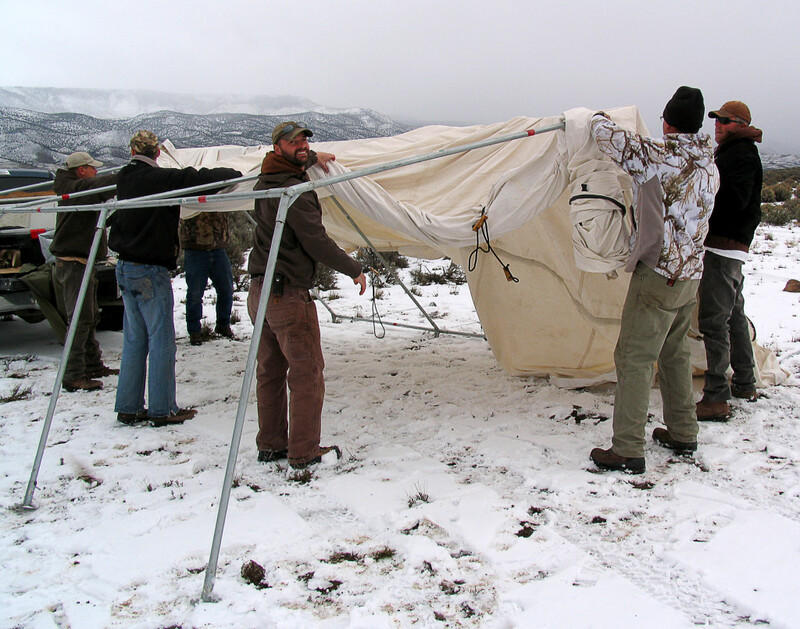 The men moved quickly and quietly with a calm demeanor resting a reassuring hand on each doe’s back or side every once in a while as she would begin to show signs of panic. Before releasing them back into the wild, researchers implanted a GPS tracking device in the does’ birth canals so when the fawns are born they can find them easily and collar them for their study. BYU Professor of Wildlife Ecology Brock McMillan said the methodology the team uses is by far the most efficient way of gathering does to examine their health and track them and their offspring. Aware of the stress involved for the doe, he said, it is always important to work the does through the exam process as quickly as possible so they can get them back into the wild. 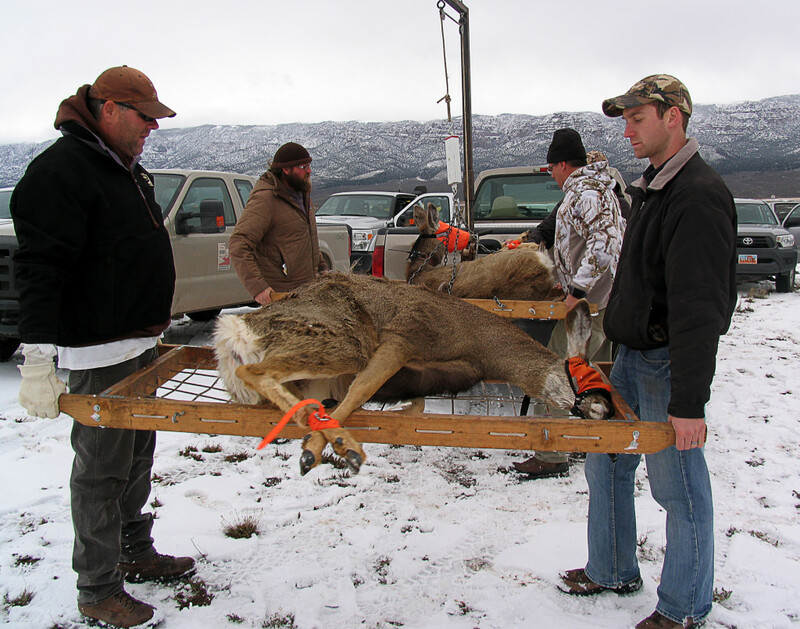 Though previous studies have looked at the decline in the population of mule deer by examining the adult population, he said, this particular study is the first of its kind. 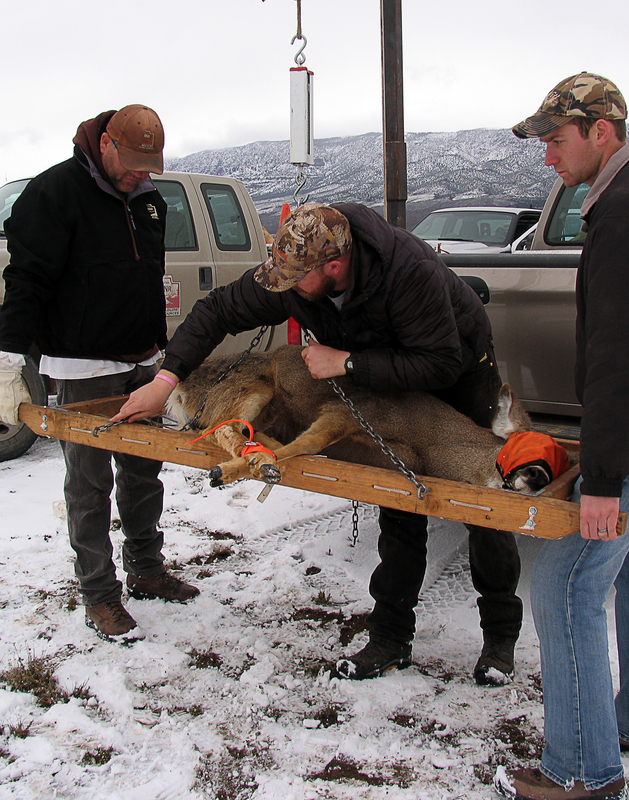 It charts a new course of study by looking at fawn survival and using a controlled and uncontrolled predatory environment to measure if predators make a difference in the mortality outcome. 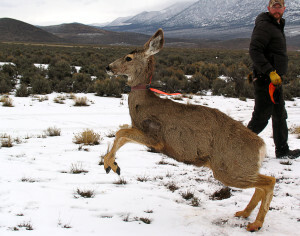 In this, the fourth and final year of the DWR study, McMillan said, they have found that, so far, about 55 percent of new fawns they have studied live to be 6 months old. 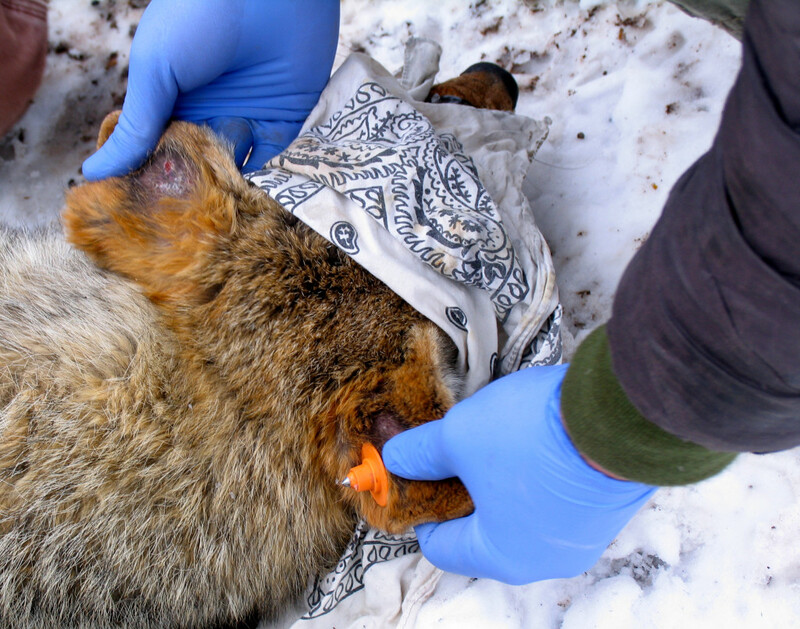 Of the 45 percent that die, he said about half of the deaths are caused by predators like coyote, the other half die from a variety of causes ranging from health issues to abandonment. 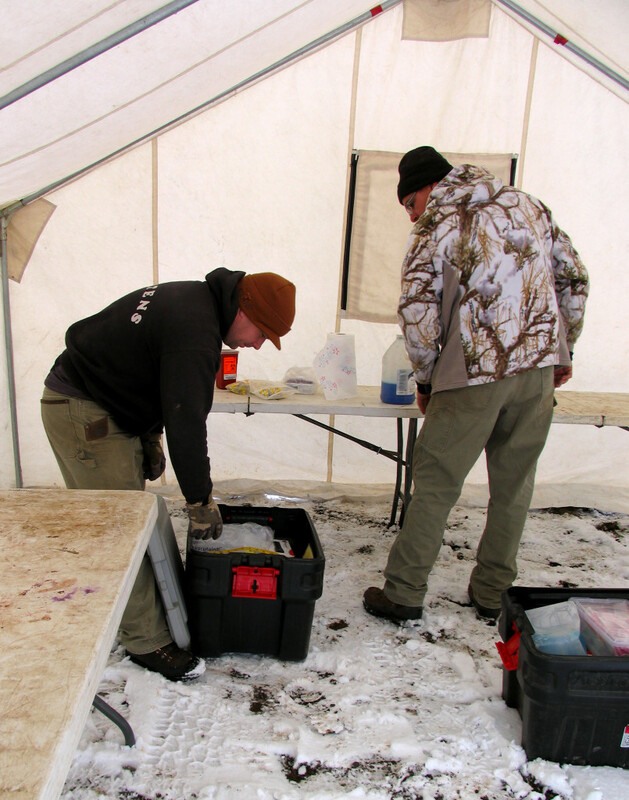 The does that were gathered in Sunday’s roundup were severely depleted in their fat resources and had been using muscle reserves to aid in survival, McMillan said, a bad sign for their future already. With vast wilderness in Utah, and the depth of the information required to answer the questions DWR is asking, DWR biologist Vance Mumford said, it has been necessary to collaborate with as many entities as possible throughout the four-year study. Project funding comes from an outside foundation, he said, and DWR contracts with the helicopter company for wildlife capture, BYU is responsible for deer and fawn data, and USU covers the coyote and predatory portion of the study. 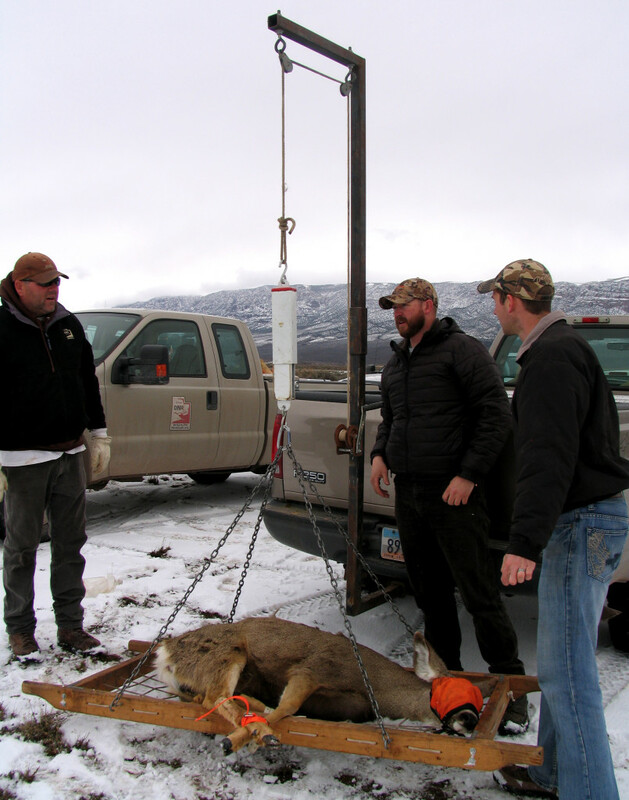 The end goal is to not only better understand how mule deer populations are impacted by fawn survival and predator control, McMillan said, but also to find a way to ensure continued survival for the species of deer. 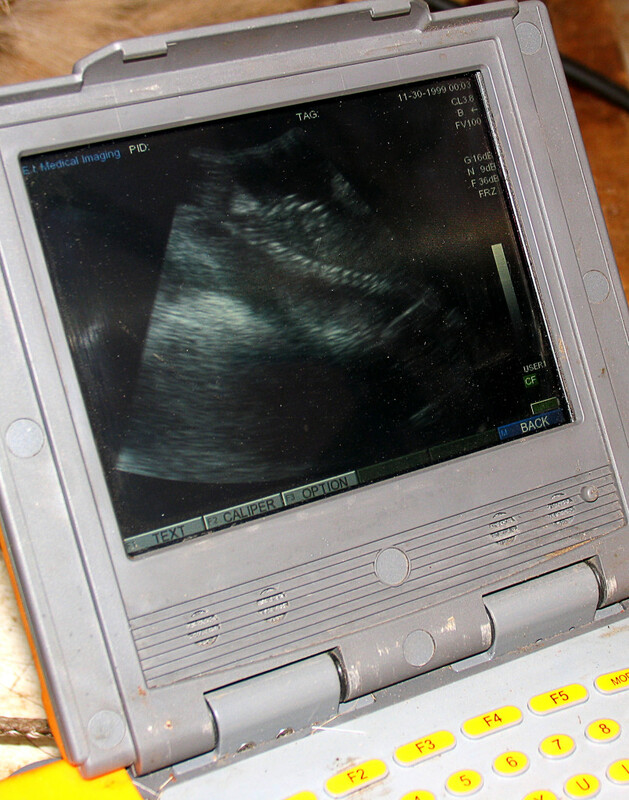 Seems like an awful lot of time and expense here for a lot of useless data. 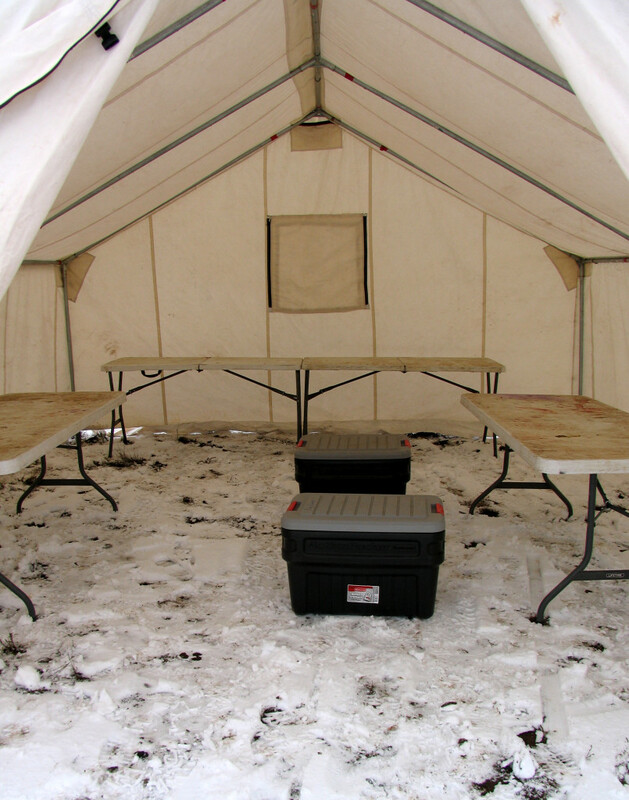 But, I guess our tax dollars have to go somewhere.